Need a copy of Windows in ISO format? Look no further than Windows ISO Downloader, an application which easily allows you to download a copy of Windows in ISO format. It can also download select copies of Microsoft Office in different editions. 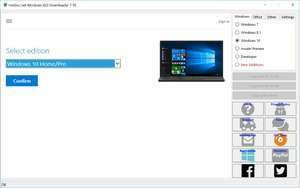 The user interface and layout of Windows ISO Downloader is simple enough to understand and grabbing a copy of your selected ISO file is easy. Version 8.09 is a freeware program which does not have restrictions and it's free so it doesn't cost anything. For security reasons, you should also check out the Windows ISO Downloader download at LO4D.com which includes virus and malware tests. Additional screenshots of this application download may be available, too.